The best time to get started with surveys is the new year. No joke – I did this for years to make extra money and it paid for my ENTIRE Christmas! 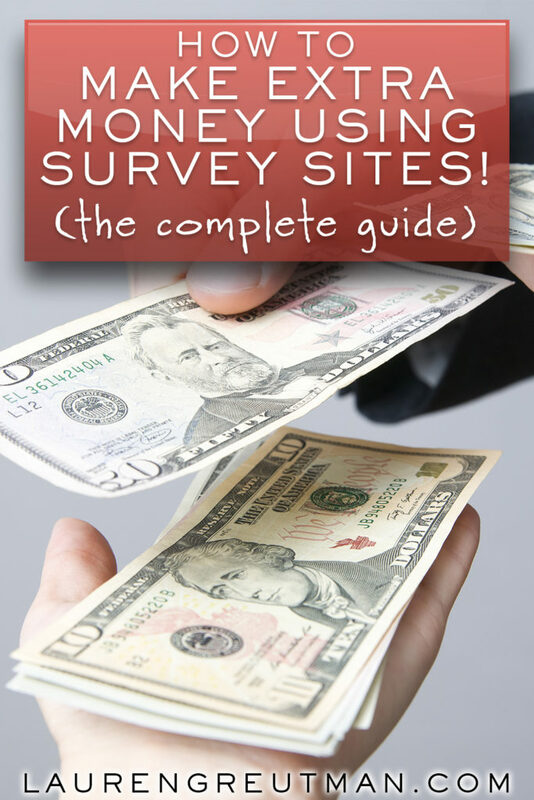 If you're looking for ways to make extra money using survey sites, you've come to the right place! I remember this one year… I was flat BROKE. I had 2 little kids. One was a newborn. We had just moved and I didn't want to get another job. We were making it by the skin of our teeth. And since we were DONE using credit cards, it was a forgone conclusion that there was to be no Christmas present buying this year. But I found a way to make extra money. I had a secret… I had created a secret account where I had earned over $500 from taking surveys in my leisure time! One of the common questions I get from you all is “How can I make extra money at home”? There are so many survey companies out there, and it can get overwhelming to know which ones to trust. I have come up with a list of 8 legit survey companies that you can use to make some extra cash at home! To make the most out of this side hustle, you honestly might want to sign up for all of them. They all have different payout thresholds, so by using all of them, you could have a more consistent income. Use a different email address. Especially if you are gonna sign up for many of them, this is a good idea. But these days, most of us have a separate email anyways for things you might sign up for online. Just make sure to check it so you know when some great money-making surveys are available! Don't spend too much time! Just make sure to do this in your spare time. This one is relatively new, but VERY promising! They payout VERY fast. This was my favorite one. Super easy, good payouts, and the surveys were actually interesting! Make money just by going grocery shopping! This one is actually kind of awesome… and with a smartphone, it's really easy. This is MY FAVORITE one! You get $3.00 per survey and I almost always qualify! I LOVE Swagbucks. In fact, I just used gift cards through Swagbucks to pay for a new dehumidifier last month. They'll give you $5 just for getting started! EarningStation provides you with the easiest way to earn gift cards online. With their high-paying surveys, discount shopping offers, and other fun ways to earn – You choose how you earn. You can earn points for opening emails, then trade those points into gift cards. And when you purchase through ebates, the points just keep accumulating. I would love to know what your experience has been with survey sites too! Which ones are your favorites? Have you been able to make extra money? Lauren, Have you ever tried or checked this one out? I would like to know what you think. I’m SO excited to get started in trying these! I was always nervous before that they were all just scams. I use eRewards. Your earn money per survey (25¢ if you DQ) and when I get to $25 to cash out I redeem points with JetBlue ($25 for 50). It adds up fast. I fly a ton and it helped me get a free flight from Tampa to NYC. There is an app as well as a website. I have tried some of the survey sites you recommend. I ALWAYS get ‘I don’t qualify’ fot the survey after i have spent the initial 3-5 monutes. What am i doing wrong? Vicki, to make sure that you get the best surveys make sure that you fill out your profile all the way. They are looking for very specific people, so if you don’t have kids put that there. Try to get as specific as possible that way they will screen you before you have to spend a few minutes taking pre-qualification surveys. Great list, Most of the people are receiving their payment correctly, there was the common complain where everyone keeps repeating, the reason they are selecting scams, the scams are cheating innocents by fake promises, keep doing this quality work, keep sharing with us.